This post is sponsored by Honeycat Cosmetics. Did you know Ancient Egyptians believed that cats could make their female masters irresistible? 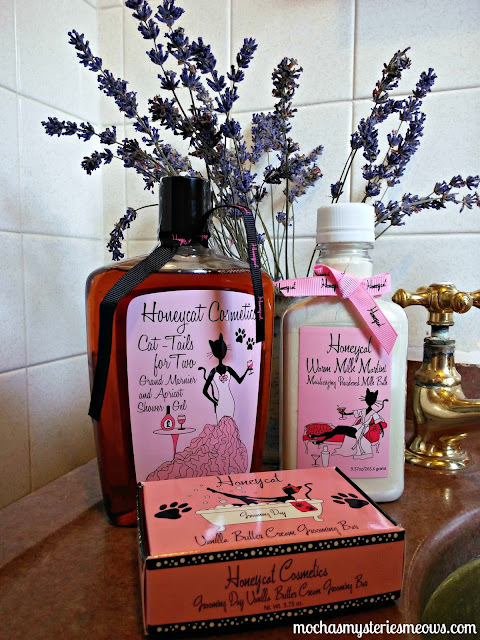 Honeycat Cosmetics, a line of bath, body and spa products, uses the cat as a symbol of female strength, and everything in their line has a feline spin! It's a good thing this bar of soap has the Honeycat logo imprinted on it or the yummy scent might make you mistake it for a cupcake with buttercream icing! Shea butter, aloe and sweet almond oil make this soap a feast for your skin. Some people swear by warm milk to help them relax and get to sleep, but why not soak in it instead? Chock full of coconut milk powder, honey powder, yogurt milk powder, skin softening milk proteins, vitamin E, and shea butter, this milk bath is sinfully delicious and extra rich. Who says you can't take a bath standing up? This shower gel produces loads of bubbles while moisturizing your skin with sweet almond oil, mango butter and shea butter. This coconut milk/mango pure soy candle will leave you purring with contentment. Have I mentioned yet how ridiculously adorable the packaging on these products are??? These delicious muscle soothing, chocolate, amaretto and mint bath crystals come in a sardine can!!! I much prefer applying hand and body cream each day for a light, delicate scent over harsh perfumes. This cream is chock-full-of skin softening ingredients like shea butter, kukui oil, honey, and of course butter milk. I think bath bombs are just so darned cute. Frisky Kitty is loaded with ingredients to pamper your skin. These bath bombs are available in four flavors: oatmeal, cocoa butter, lilac & honey, and rose & lemongrass. Phew! And I haven't even touched on the fun gift sets, scrubs, bubble baths, lip balm, even a darling little wash cloth! Now who's ready to lavish themselves with some Honeycat? 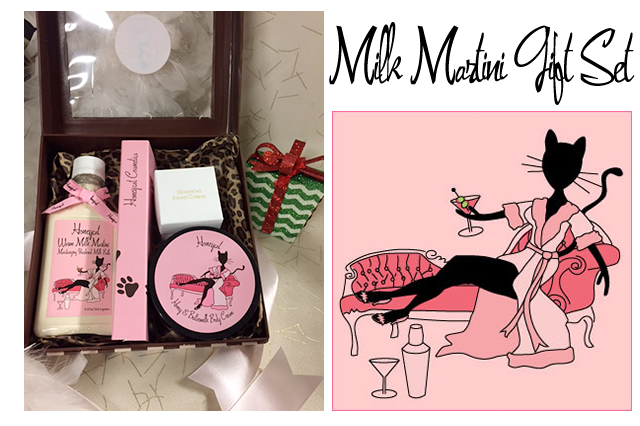 Not only do we have a pawsome 30% off discount code (PURR30 at checkout), we also have TWO gift sets to give away to lucky winners in the US! The Chick of the Sea gift set contains: Coquito/Coconut Rum bubble bath, Chick of the Sea foaming bath crystals (in the sardine can!) 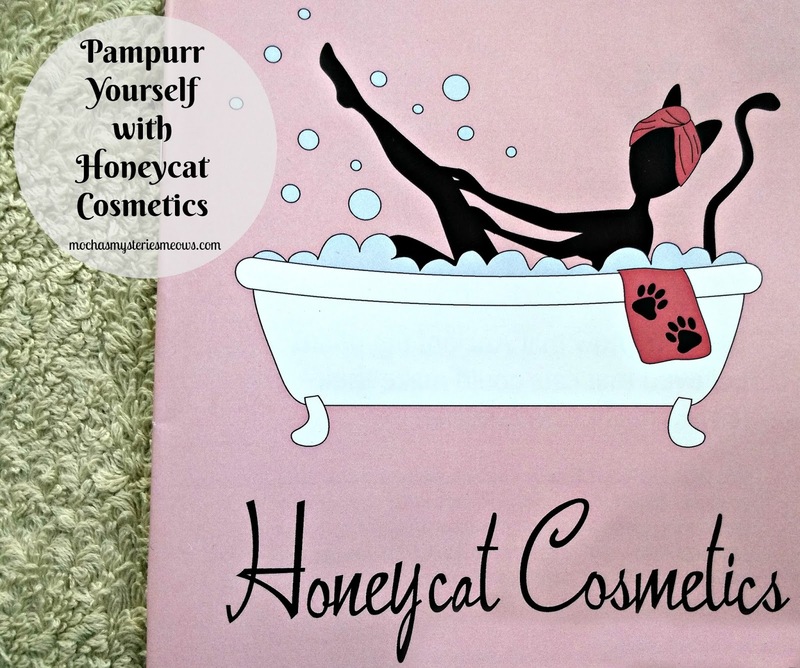 and the Honeycat Signature washcloth. The Milk Martini gift set contains: Milk Martini Tequila/Lime milk bath, sweet cream/bourbon bath bomb and Rub My Tummy buttermilk & honey body cream. To enter, simply fill out the Rafflecopter below. Good luck everyone! Disclaimer: This post is sponsored by Honeycat Cosmetics. We are being compensated for featuring this content but all opinions are our own and we never recommend a product we don’t fully believe in. My momma luvs bath bombs too - I bet she'd like the Frisky Kitty one. Both the sets look pawsome, but she's really interested in da Milk Martini set. I got such a kick out of the Cat on a Hot Tin Candle. I love it! And I also really love the sound of the body cream. Though it's pretty much impossible to choose, I think that gift set would be especially lovely. Thank you for sharing these with us, Mudpie and Melissa! Oh, these look awesome! My human has a friend whose birthday was last month, and although they usually don't exchange gifts, she thinks something from this line would be perfect for her! The milk martini gift set looks great! Our favorite item is the shower gel. We would prefer the milk martini gift set. I love bath products with unique (and sweet) scents. So many just smell good but don't really do much else ... these sound like the exception. And what a cute concept!!! What a delightful giveaway. The gifts sets are precious. I like them both so much but The Chick of the Sea is perfect. Thanks. Looks like some wonderful items! This sounds like a purrfect treat for every cat lady! I am totally between the milk baths and the lilac and honey bath bomb (anything with lilac)! I think I like the Milk Martini gift set best. I would love to try the shower gel but I also love the candle. I love both sets! These look great and I am SO happy to know about a new (to me) product! I like the Milk Martini set due to my partiality for bath bombs. TW loves milk baths. I'd love to gift her with the basket. I would like The Cat Tails for Two. All the products look and sound amazing. Those all look great, especially the apricot one. 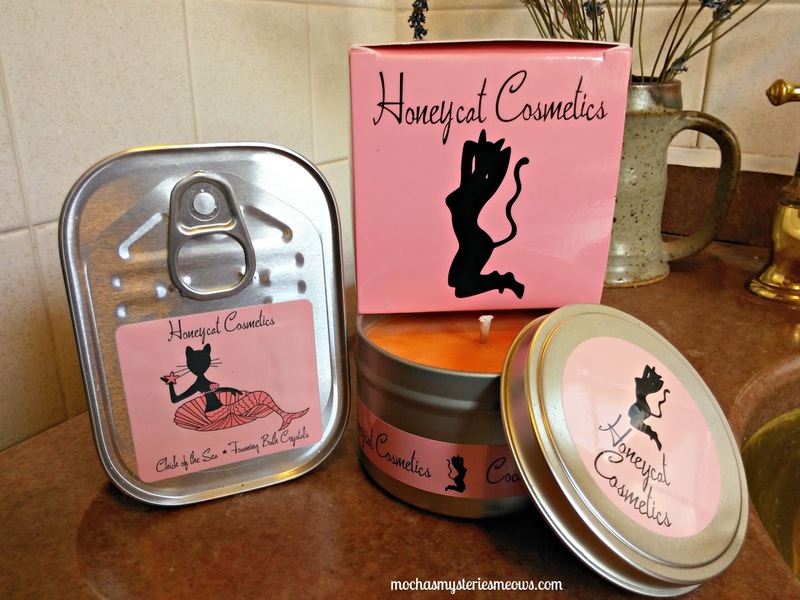 "What's your favorite Honeycat item in this post? Which gift set would you prefer?" I like everything! They all look very luxurious! What fun! I think the shower gel is my favorite. I would prefer the Milk Martini set. How adorable! I will check the company out. Thank you for showing new products to me. I have never tried any of their products yet, but now I want to. I would like the The Milk Martini gift set contains, I want to try the sweet cream/bourbon bath bomb. I would prefer the Rub My Tummy Hand & Body Cream! I like the Cat Tails for Two Apricot/Grand Marnier Shower Gel. It sounds awesome. And I like the Milk Martini gift set. The Milk Martini gift set is my favorite. I found several great ideas for Christmas gifts for my cat loving friends. THANKS! I would love to try the Cat On A Hot Tin Roof candle! What a fabulous and fun giveaway, thanks for the chance!! !